Above: Thai residents wade through floodwaters from Tropical Storm Pabuk on Friday, January 4, 2019, in Pak Phanang, in the southern province of Nakhon Si Thammarat, southern Thailand. 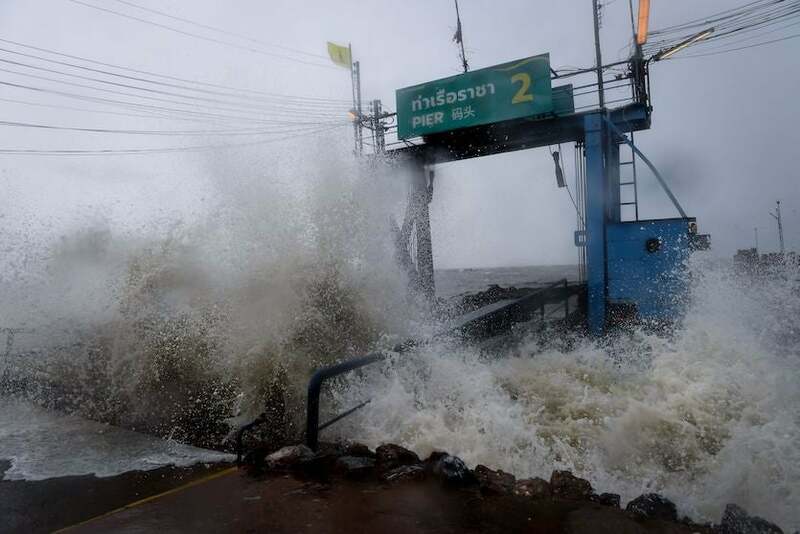 Rain, winds, and surging seawater struck southern Thailand as Pabuk approached coastal villages and popular tourist resorts. Image credit: AP Photo/Thanis Sudto. The world’s tropics are kicking off 2019 with an impressive spate of activity. The developments include Thailand’s first tropical cyclone on record so early in the year, two named systems in the Southwest Pacific, and the potential for an oddly out-of-season tropical cyclone in the Northeast Pacific. The highest-impact system on Friday was Tropical Storm Pabuk, which brought heavy rains and high winds to southern Thailand in the midst of the dry season. Pabuk made landfall near Pak Phanang, about 370 miles south of Bangkok, around 12:45 pm Friday local time (12:30 am EST), according to the Thai Meteorological Department. 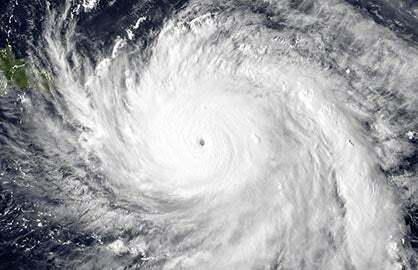 Top sustained winds were around 60 mph, according to the Joint Typhoon Warning Center. Pabuk was moving off the west coast of Thailand early Saturday local time. Figure 1. Waves from Tropical Storm Pabuk crash into a pier in the southern Thai province of Surat Thani on Friday, January 4, 2019. Image credit: Lillian Suwanrumpha/AFP/Getty Images. No reports of major damage from Pabuk had come in by late Friday local time. One person had died and another was missing after a fishing boat capsized in the Gulf of Thailand, as reported by weather.com. Thai officials warned of the risk of flash flooding from torrential rains of up to 10 inches, along with surf as high as 16 feet along the Gulf of Thailand coast. 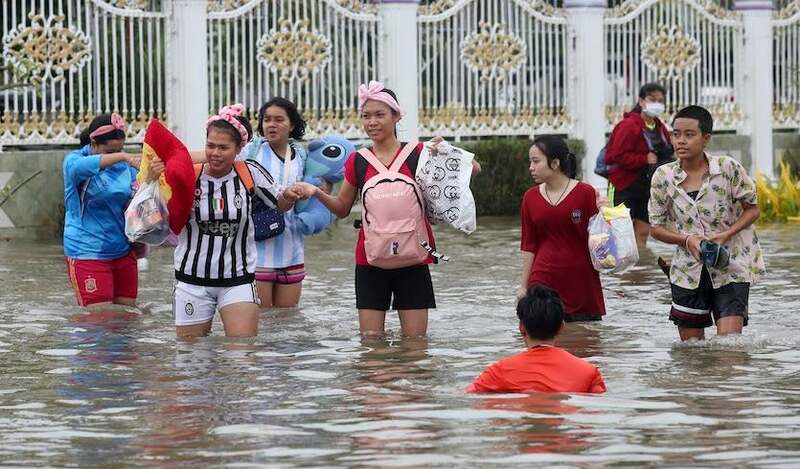 At least 30,000 residents were evacuated from Nakhon Si Thammarat province, and the storm threatened to affect many thousands of high-season tourists along Thailand’s east and west coasts. Pabuk is the first tropical storm to strike Thailand during January, February, or March in records going back to 1951. Even during the mid-year wet season, Thailand’s coastal geography and its very low latitude keeps the number of powerful tropical cyclones on the modest side. Since 1891, only one hurricane-strength cyclone has made landfall in Thailand. That was Typhoon Gay, a compact, fast-strengthening system that struck the east coast in Chumpon Province at Category 3 strength (115-mph sustained winds). 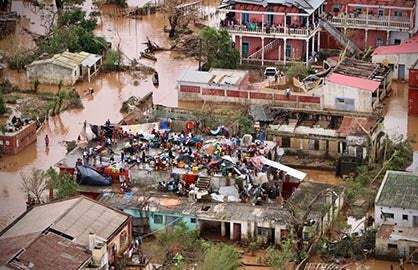 Gay caused an estimated 833 deaths and roughly $500 million USD in damage. Pabuk is predicted by the Joint Typhoon Warning Center to move into the Andaman Sea on Saturday. It could strike the Andaman Islands at tropical-storm strength on Sunday night before weakening as it arcs north and northeast toward Myanmar. Figure 2. Enhanced infrared image of a broad area of disturbed weather associated with an upper-level low southwest of Mexico at 2035Z (3:35 pm EST) Friday, January 4, 2019. Image credit: tropicaltidbits.com. 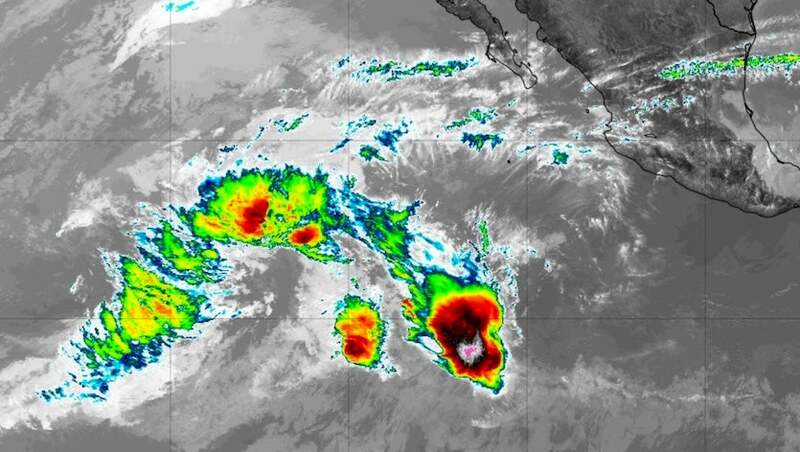 Forecasters at the National Hurricane Center—working without pay because of the government shutdown—have been monitoring a broad, disorganized patch of showers and thunderstorms (convection) about 1200 miles southwest of Cabo San Lucas, Mexico. In a special tropical weather outlook issued at 1:40 pm EST Friday, NHC tagged this area with a 30 percent chance of subtropical or tropical development by Saturday afternoon. After that point, conditions become less favorable. Even if this system were to develop, it wouldn't last long, as it would quickly be pulled north over cooler waters. However, the mere chance of a Eastern Pacific tropical or subtropical cyclone in January is enough to raise eyebrows. 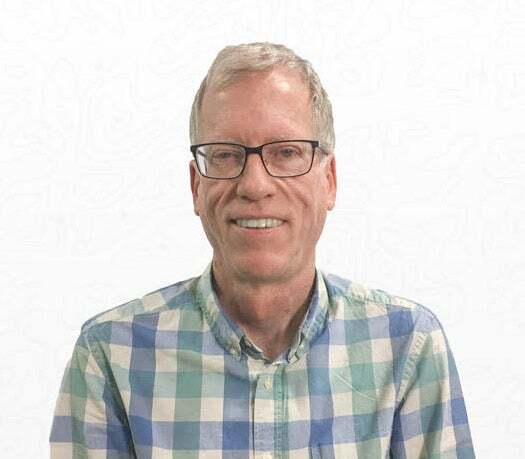 Earlier on Friday, when NHC was calling for 50% odds of dvelopment, hurricane expert Michael Lowry (FEMA) noted that the region has never seen a named storm in the first four months of any year since records have been kept. Any development on Friday or Saturday would likely be subtropical in nature, linked to an upper-level low that is unusually strong for the area. This low is a spinoff from Winter Storm Fisher, the large, strong upper system that brought snow this week to higher elevations of Arizona and New Mexico and to parts of Oklahoma and Texas. 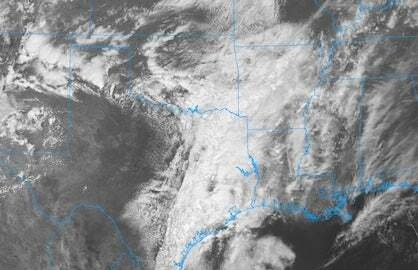 Cold upper air associated with the spinoff low is helping to trigger convection in the area of NHC interest. Figure 3. Enhanced infrared satellite image of Tropical Cyclone Penny at 1940Z (2:40 pm EDT) Friday, January 4, 2019. Image credit: CIRA/CSU/RAMMB. Tropical development is much more seasonable in the Southern Hemisphere this time of year, and we have two potential landfalls south of the equator over the next few days. Tropical Cyclone Penny has already made two strikes on the Cape York Peninsula of far northern Australia, the second one while at tropical-storm strength. After looping around the peninsula, Penny has moved well to the east over the last several days. Penny had stalled on Friday about 600 miles east of Cairns, Australia, with top sustained winds of around 55 mph. 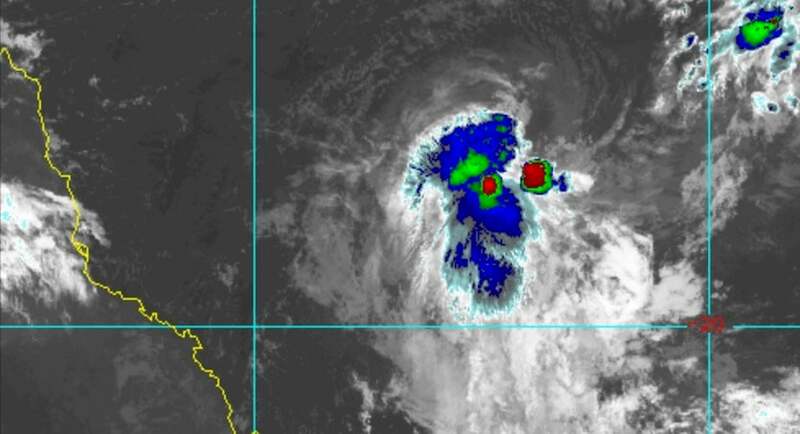 Penny is expected to start hooking back westward by Saturday, and later next week Penny could make its third Australian landfall, this one most likely north of Cairns. 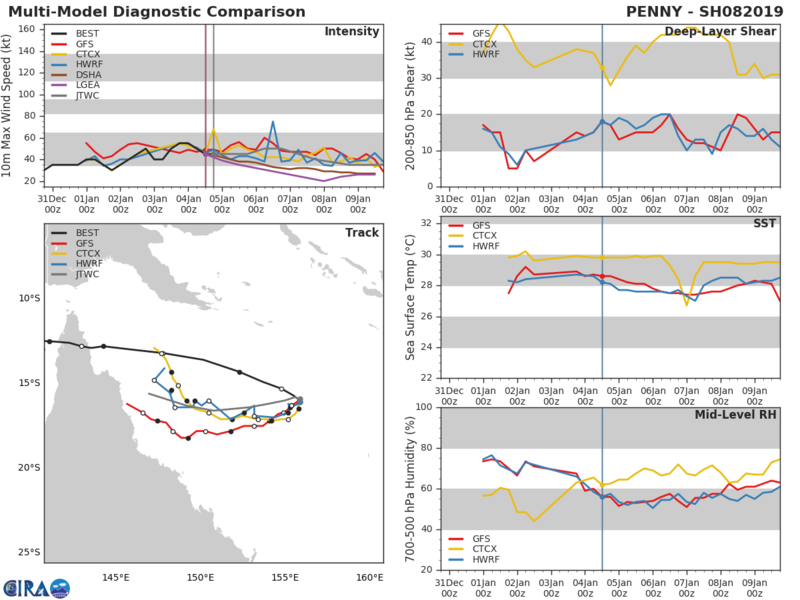 Penny is currently fighting strong wind shear of around 20 knots, and recurrent periods of shear are likely to keep Penny from taking advantage of warm sea surface temperatures of around 28°C (82°F) before it approaches Australia yet again. Well to the east of Penny, Tropical Cyclone Mona appears to be taking a bead on Fiji. Mona’s broad, weak circulation was packing top sustained winds of only 45 mph late Friday, according to JTWC, and little convection was evident on satellite. “A plate of scrambled eggs has more structure,” quipped Josh Morgerman on Twitter. Mona is drifting over very warm waters of 29-30°C (84-86°F), with moderate wind shear of 15-20 knots, conditions that favor some strengthening. By Saturday night local time, Mona is expected to accelerate on a southward-arcing path that could take it across one or both of Fiji’s two major islands on Sunday local time. By that point, models indicate, it could be at strong tropical storm or Category 1 hurricane strength.